I was quite seriously considering another theme post, involving today’s World Cup final. I had even found a nice combination of German and Argentinean recipes. But it’s monsoon season here, and I don’t feel brave enough to go out in the rain and pick up the missing ingredients. So I figured I’d make something that will finally conjure up summer: spanakopizza, as my dad called it. Otherwise known as spinach pizza dough. Put your spinach in a large bowl and cover with hot water from the kettle, and let stand a few minutes, just so the spinach wilts. Fish out the spinach and gently squeeze out the excess water. Place the spinach in a measuring cup and add water to make a volume of 65ml (approximately ¼ cup). Pour into a blender and purée until smooth. In a large bowl, add 65ml warm water. Sprinkle the sugar and yeast over the water, and stir to combine. Set aside until it becomes foamy, about 5 to 10 minutes. Add 100g of flour, the salt, oil, and spinach puree. Knead, gradually adding the remaining flour. When all the flour is incorporated, form your dough into a ball. Drizzle a little olive oil in a bowl, roll your dough around to coat, and cover. Let it rise in a warm place for 30 minutes or until doubled. Once your dough is ready, roll it out and shape it into one medium or several small pizzas. If you want to bake your pizza(s) immediately, preheat your oven to 200°C/400°F, add your favourite toppings and bake until the crust turns golden and the cheese starts to bubble. Alternatively, you can make your own frozen pizza(s) for an easy dinner. In that case, line a cookie tray with baking paper, slide your pizza(s) onto it, add your favourite toppings and pop the tray in the freezer overnight. You can then wrap the pizzas individually in Clingfilm or in a zip-top bag. 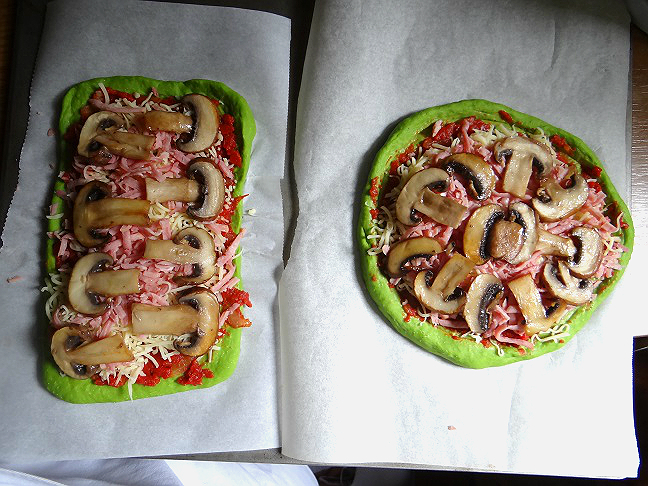 I love your blog, it is so colourful with lemon yellow wallpaper, tomato red tarts, blue cookies and now green pizzas! All one needs to cheer up one’s mind! Bravo for your imagination, Alalemon, keep on! This original pizza seems very interesting to try, the taste must be unexpected too. But, what is the purpose of sugar in a savoury dough? Doesn’t it give a sweet taste? And, can other greens be used instead of spinach? I was thinking of basil, for example, which is delicious with tomato pizza sauce. Quite frankly, you don’t really taste the spinach. I expected a stronger taste, but I was myself surprised at how little the taste of spinach comes through. I think basil would be a very nice option too, although I may use a lot less since fresh basil has a much stronger taste than spinach. 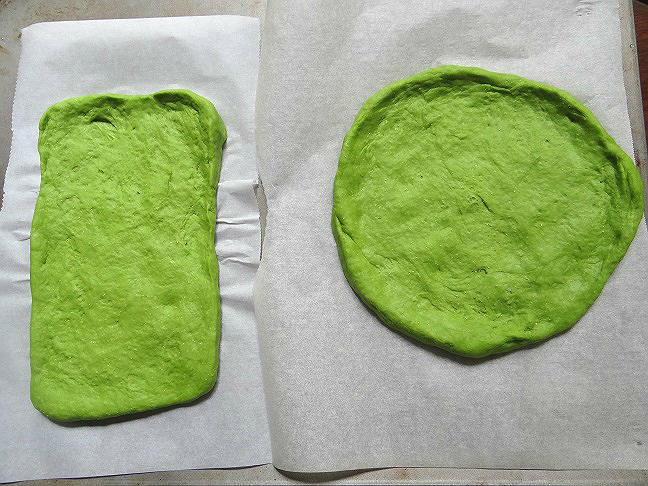 Glad you enjoyed the spinach dough, yours looks awesomely green! Since you had only mentioned « fresh spinach » in your recipe, I used some fresh baby spinach, so that must be why it’s so green.